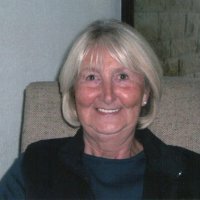 The group was formed by Joan Hobson. Joan is now an Honorary Life Member of the club and visits whenever she can. It is always lovely to see her. I have been asked how I came to start Guiseley Art Club in 2000. The answer is easy. Guiseley didn't have one. All the towns around did. My husband said, “Don’t witter about it. do something.?". I put an advert in the Otley Free paper with my telephone number, and said if anyone who had painted before, or who wanted to have a go, to please get in touch. My daughter printed flyers and I put them up in shops and the local library. My phone never stopped ringing! Our first meeting was 17th July 2000. Initially, I ran the club from Guiseley Theatre, however, eventually found a more suitable venue at Oxford Road Methodist Church Hall. This was following our first successful exhibition there, and I realised it had wonderful facilities for our type of group. It became apparent that some members were very talented and supported others who perhaps needed some guidance. We also had demonstrations by leading Artists who visited the club throughout the year. Whilst the club is clearly an "Art Club" it’s so much more than this. It’s a social gathering of different people who all have an interest in the Arts. We spent many a happy Christmas meal together, and continue to do so. Many of us have made good friends for life, and I miss the ones who have sadly gone. My husband and I moved back to Ilkley, and following his illness, it became impossible to go to the club as much as I would have liked. I still keep in touch and am proud my small club has grown into what it is today. The club is suitable for both the novice and experienced artist of all ages. Your first meeting is free, you have the opportunity to see how you feel about joining our friendly group. Of course we hope your first experience will not be your last. We have lots of space in our very airy room, flooded by natural light. Car parking right outside with level, ground floor access to all facilities. We meet at the Methodist Church Hall off Oxford Road, Guiseley LS20 9EP. We like to party and last Christmas around 25 members had a delightful lunch at a local pub. We will be doing something similar this year, venue to be announced. Places on the Committee are coveted. If you are hoping to join and have a place on our Committee you will need to join the queue. Ha! Ha! Seriously, they do a sterling job and you will be welcomed with open arms. ( If they can spare the time as they run past you out of the door). Current membership is £60 for a full year. (This equates to £1.37 per meeting). We close for the bank holidays and finish mid Dec for the Christmas period. It also includes refreshments and all demonstrations and workshops. Your membership includes the opportunity to have 4 or more paintings (subject to space available) on the club web site. Any purchase enquiries that may arise from this publicity are to be handled by you the artist directly. The club will simply pass on the enquiry details to you. Currently the club does not make any charge for this service and considers it to be part of the advantage of being a member of Guiseley Art Club. Currently we have space for each member to enter up to 6 paintings in our exhibitions. You may have as many paintings as you wish in your portfolio. We usually have a crafts table at the exhibitions and you are welcome to fill it up. The club retains 15% of all sales of paintings and craft items which goes towards the cost of hiring the hall for the weekend. In common with many art clubs we do require members to offer their help in any way they can. Exhibitions are a busy and fun time for us. Whenever we can we like to share out the fun of taking part.. Many of the tasks can be taken in 2 hour slots which stops people from grabbing all the best activities and holding onto them for hours. Whenever you see a list put your name on it quick.